Thanks to some generous friends of ours and the husband of whom's even more generous boss (please don't make me try to figure out the correct grammar for my previous phrase), we got to traipse off to The Races...fo' free. For those of you who did not have the pleasure of experiencing this cultured affair, I thought I would recap it for you. I know, I know. What can I say? I give the people what they want. We open to a scene teeming with people dressed in brightly colored dresses, bow ties and seersucker, backdropped by light grey skies. It pretty much just looks like tailgating at any given SEC school at this point. Only with more hats. After parking inside the track (that's what hob-nobbers get to do, by the way), we made our way up to the hill where it seemed the VIPs were sitting. We inferred this based on the fact that there were giant white tents, and we figured "box seat" might equal "tent" at Steeplechase. That's about all we were going on. Hiking up a hill in rain boots and a hat that obscures my vision was harder than I thought it would be, but no matter, we were officially IN. The upper-crust. The other half. We'd made it. After we'd made it, we had no idea where to go next. We explained this to the usher, who was clearly unamused that we had obviously never done this before and (I assume) tried very hard not to roll his eyes whilst telling us our box number was on our wristbands. Our wristbands, which we had been required to wear in order to get into the Hob-Nob Section. Our wristbands in which the box number was covered up by the sticky part of the bracelet, making it impossible to see. Our wristbands which he then said he did "not advise" taking off. Sigh. It's hard being a first time hob-nobber. After a pained struggle with Craig's bracelet to determine our booth number and the aforementioned exasperated usher directing us, we were finally in our box. Boxes, we found out, are not boxes at all but actually rectangular grass spaces marked off with metal guardrails in which eight wooden folding chairs are placed. 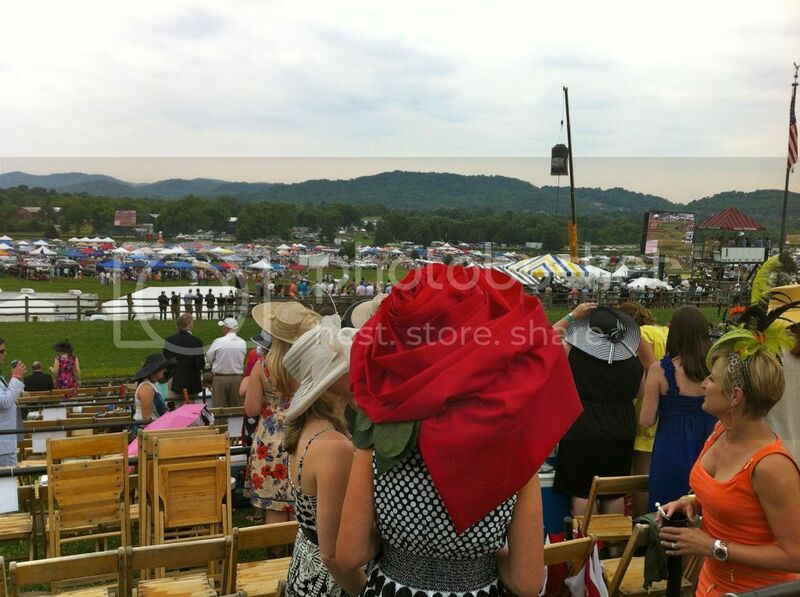 But they are arranged like stadium seating and we had a great view of both horses and outrageous hats, so it was a win. I seriously considered leaning over to one of our fellow hob-nobbers and saying, "so whe-ahr does every-wahn summah?" like Phoebe when she visits Mike's parents, but I refrained. But it was pretty much like that. OH YES. YES, THAT IS A ROSE-HAT... AND/OR TOWEL. 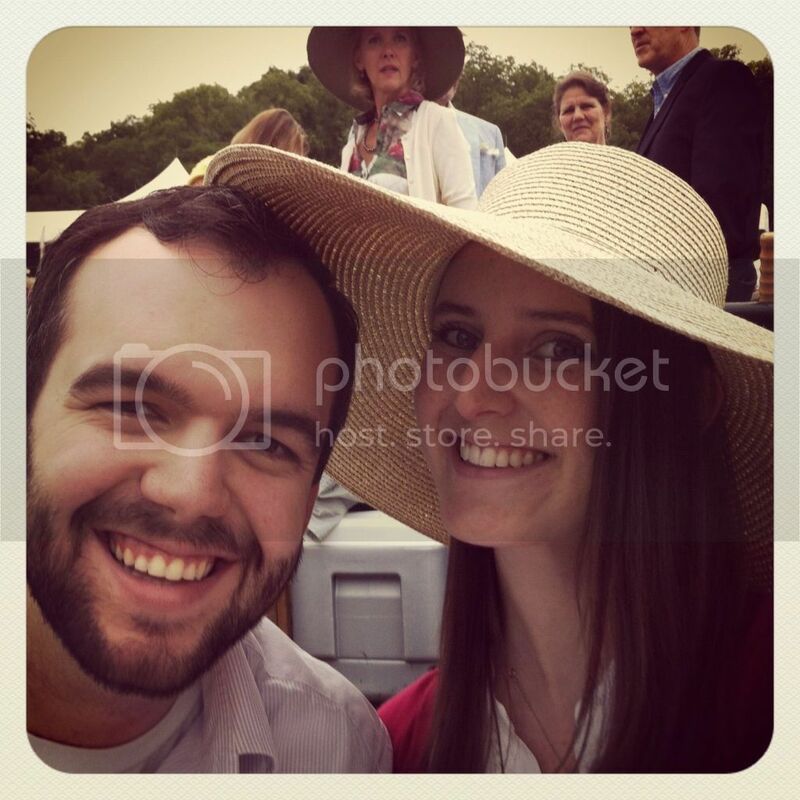 She was in the hat competition but didn't win. What a sad thing to go out and buy that monstrosity just for this occasion, enter a contest, stand in front of everyone, but still not get any glory at the one place people reward that sort of thing. Wah-wahhhh. 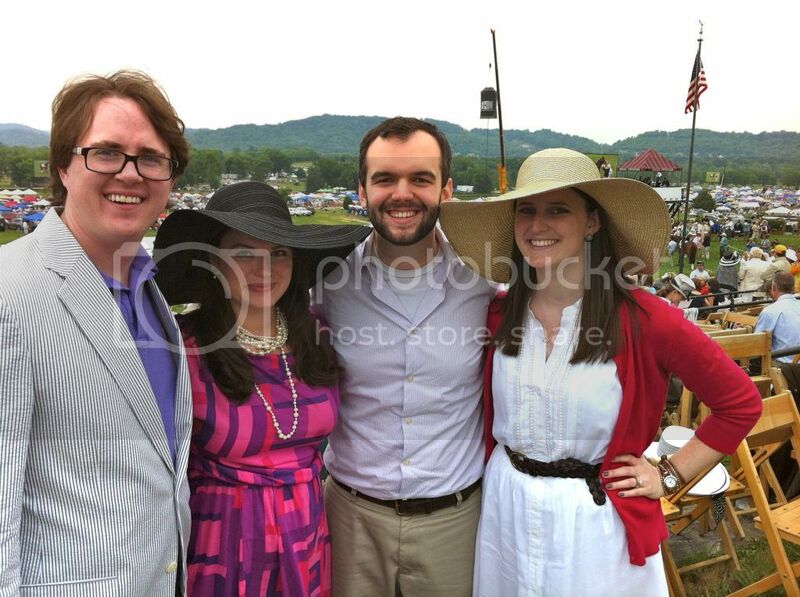 The four of us had a point system going and picked horses for each race. It was noted several times that never in our lives had we gone from not caring at all, to super-invested, to super-disappointed so quickly. 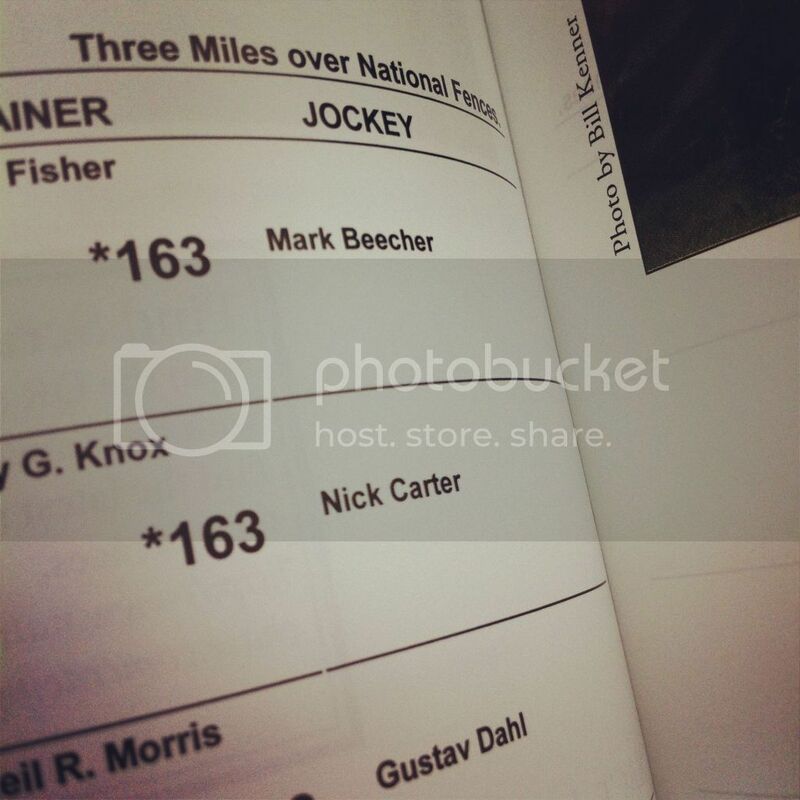 Pictured above: I unknowingly picked a horse with a Backstreet Boy for a jockey (naturally), but he did me no good. I lost. GET IT TOGETHER, NICK. It's like you'd never ridden a horse to win thousands of dollars before or something. RACE 1 Winner: Bluegrass Summer [A.K.A. the one with the least-interesting name] My Pick: Memorial Maniac. Way better name. RACE 4 Winner: Quiet Flaine. I picked this horse! Mostly because I thought his name was Quiet Flame and kept him anyway when I realized it wasn't. Score 1 for breaking the trend. Worth noting: The chosen favorite, Sweet Shani (who Craig picked), didn't even finish the race. Seriously. Just gave up and started walking. You're never going to win with that attitude, Shani girl. All in all, I'd say it was a success. We wore hats (thanks to my friend Taylor), bright colors and seersucker so we totally fit in and no one was the wiser that we brought Kroger brand pretzels. Note: We found out later the winning horse died of an aneurism, which I was shocked and devastated to hear. But of course, we missed it, so if you were hoping to hear about that...sorry. 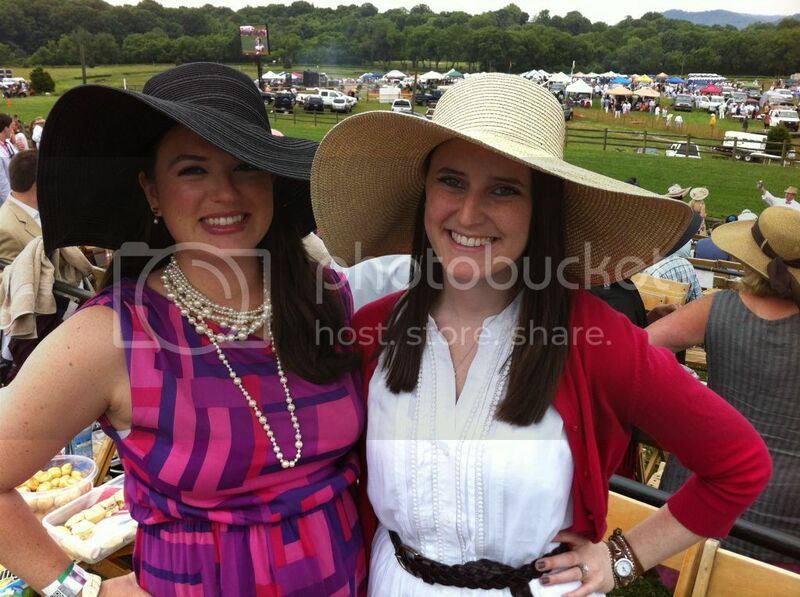 Have you ever been to Steeplechase (or a similarly high-class event)? Older PostNBC, Why Are You Like This?